Trip to Ag. Georgios, Selinari, Ag. Nicholaos & Lassiti in 1961. What I have to show you here is a rare film posted by John Sooklaris on Youtube. Now John has posted several films on the web that you can see here on this site. This film, from 1961 is special. It shows a trip calling in at St George, Selinari; a celebration at Agios Nicholaos – including a diver – and loads of people. Then the bus trip goes on to the Lassiti Plateau and actually shows all the spinning windmills that were so famous there and that I mentioned here on this site a while ago. So here is the video, I hope that you enjoy it. This Anzac Day will be especially poignant for one Mt Eden author as he releases his first book about a heroic World War Two battle. Graham Power’s book, The Battle of Pink Hill – Crete, 1941, depicts the 12-day struggle on the Mediterranean island in which more than 670 Kiwis were killed. Mr Power was determined to tell the story and spent six years working on the book. 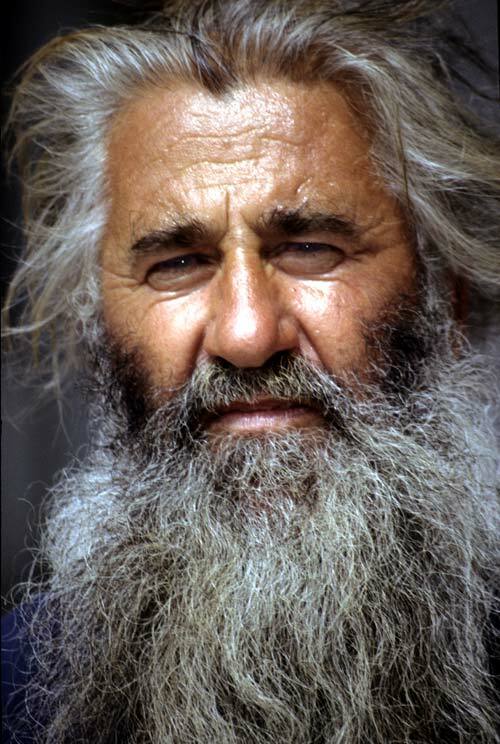 He visited Crete in 2005. 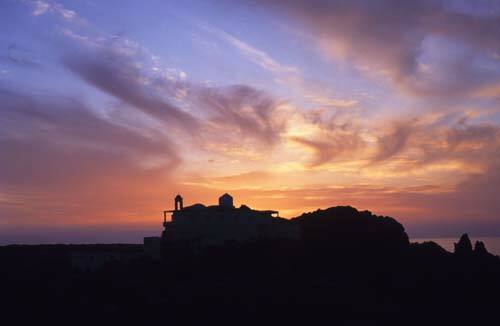 “Going to Crete was the highlight. It was a bit unreal – that people were killing each other left, right and centre. It is extremely peaceful now.” Of the nine veterans Mr Power spoke to during his research, four remain alive. “I concentrate on this battle, my book is hopefully balanced because it shows the German side too,” he says. Mr Power’s wife, Josephine, says her husband has had a unique experience. “He’s befriended all these vets,” she laughs. Mr Power’s daughter Hanna is also enthusiastic about the upcoming book. “Now Dad has all these crazy friends. 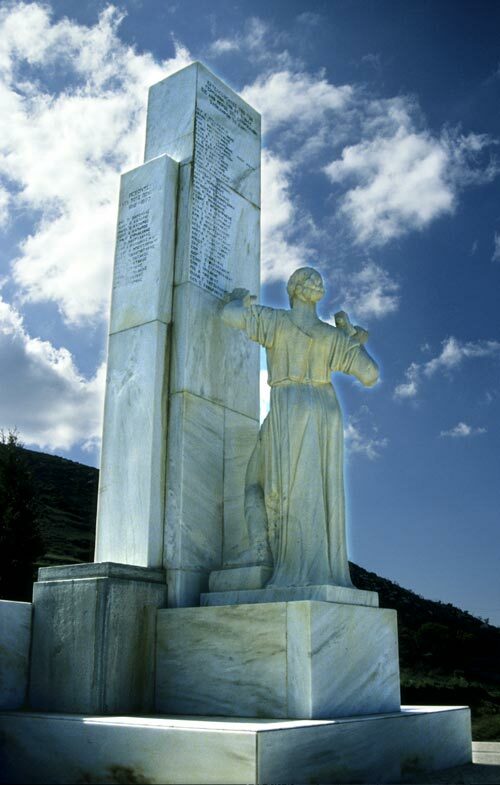 He has learnt a lot – got a lot out of it personally that he never expected.” Miss Power says her father was humbled by the hospitality shown when he visited Crete and the overwhelming gratitude to New Zealanders who fought alongside the Cretans. Brian Duncan, a family friend, helped to proof-read Mr Power’s book and says it is an unusual version of the battle that was neglected by media. 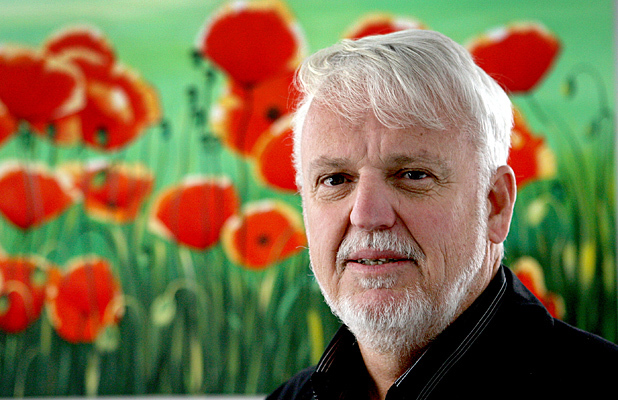 “Graham has carefully gone about finding veterans and recording their remembrances. It is a really interesting view of the Battle of Pink Hill by the people who were there.” Mr Duncan says the author has been absolutely meticulous in his research. 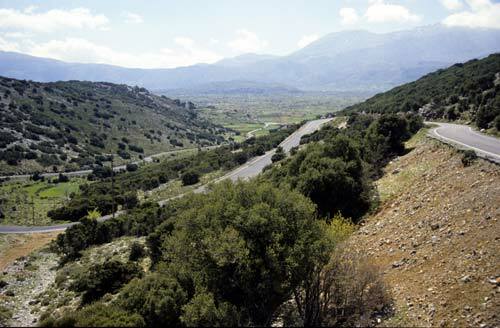 Deep in the heart of Crete, in the forever wonderful Amari Valley high in the hills south of Rethymno there are five or six villages on the western side of the valley on the slopes of the Kedros mountains. These villages, in 1944, were attacked by the occupying Germans and each one was razed to the ground by explosives. All the men were killed as well as several women. Just ordinary people going about the difficult business of farming for food for their families. No-one knows what zany reason the German troops had for decimating these peaceful villages. Some say it was reprisals for the kidnapping of the German General Kreipe, others suspect that it was to cover the German withdrawal. Perhaps there is no truth. Outside the main village, Ano Meros, there has been erected a memorial to the many dead children, adults and old people that had nowhere to run and died by bullets in the terror that happened there. The memorial consists of a woman carving the names of the dead in stone. This is a beautiful memorial in the middle of nowhere, so to speak. It attests to the immense courage and the long memories of the people of Crete. I, and I hope you too, will never forget them. 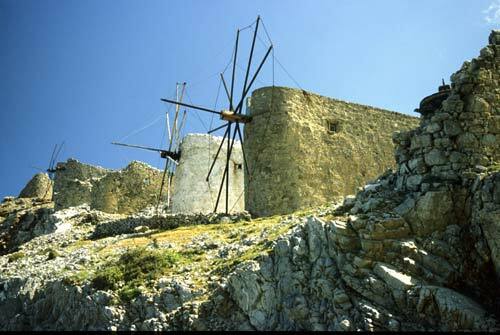 High in the mountains of Crete there is a plateau which once, some years ago, was famous for windmills. The scene of so many fluttering windmills was a sight to see. It used to look exactly like this. In fact these were not so much windmills, but windpumps. Almost every field had one and it used to pump water up from the ground to water the fields. This picture was taken around forty years ago. Today the water is supplied by electrical or oil driven pumps and the windmills are, alas, gone with the wind. Today Lassiti has changed. It still grows the staples of Crete, potatoes, apples, vegetables etc. But sadly without the wonderful windmills. But do not worry, that is the way of the modern world. There is a consolation, of course. 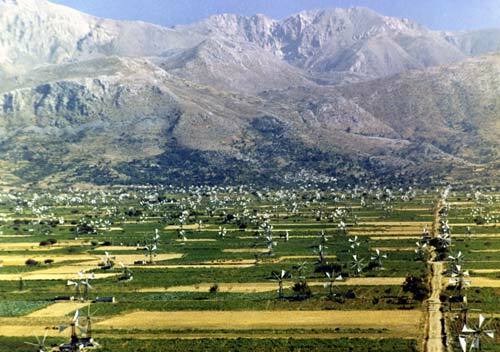 On the edge of the Lassiti Plateau were some real windmills, built many years ago to grind the corn. Today some of them have been rebuilt to house modern people. What goes around comes around. 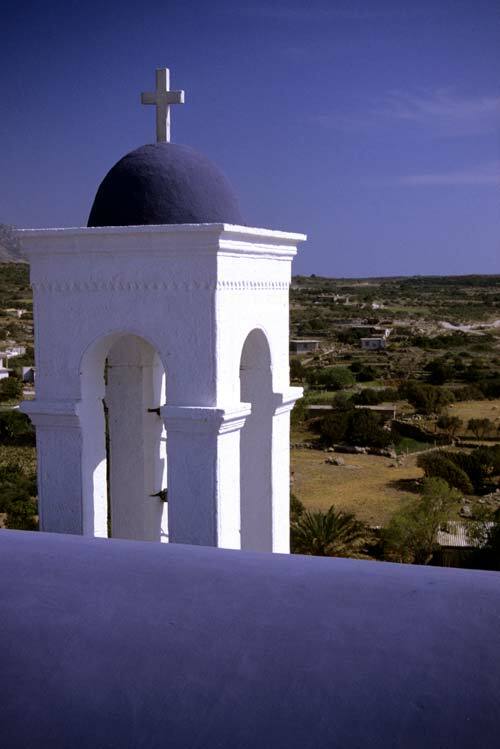 The monastery of Panagia Chrisoskalitissa, Our Lady of the Golden Step in English, is in the remote south west of Crete just six Kilometres from the lovely lagoon beach of Elafonisi. And it is glorious. This photograph was taken when the sunset happened and thank heavens I had my camera to hand for the amount of beer that we had drunk with the priest and two English hitchikers was immense. Then came the meal with wine and a room to sleep in. But the next day we explored. 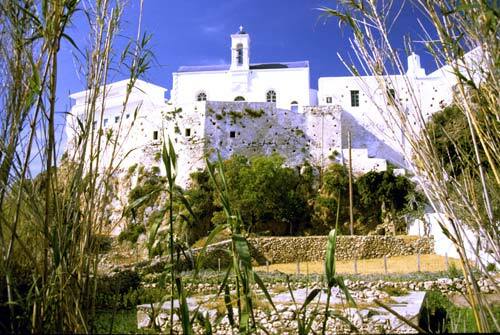 Panagia Chrisoskalitissa means Our Lady of the Golden Step. But what was the Golden Step? One of the nuns there explained to me that you have to be absolutely free of sin to see this step which is one of the ninety steps climbing up to the monastery’s front door. Unfortunately, I couldn’t see it, but the nun told me not to worry as she had not seen it either. So we climbed the steps and were invited to partake of tsikoudia (raki) with two nuns and the priest. A monastery and a nunnery seems to merge into one down here. Then I was shown how to climb to the roof of the church ‘for the view’, of course. This is a lovely place and we first went there about twenty years ago, then around ten years ago. We had to drive a gorge through a very old tunnel and some miles of dirt road to get to the monastery. Today the road is better, at least it is tarmacked, but one of the nuns is gone and the priest is much older than before when we first met him. But a wonderful man, nevertheless. Here in the deep south west of Crete there is very little tourism. There are some rooms now where you can stay and near the beach at Elafonisi – perhaps Crete’s best beach with silver and rose coloured sand – there are a couple of tavernas. There are no hotels and no tavernas on the beach at all because this is one of Crete’s protected areas. But if you go there, it will stay forever in your memory. Kalamaki, a village just north of Matala on the Messara coastline of Crete is a place that we have known for many years. Just over twenty years ago we, my wife and I, were there visiting one of the two very small tavernas that were on the beach. There were a few other buildings, but not many. We were eating shrimps just fished out of the sea, and they were superb. This coastline faces west and you can watch the sun fall gently into the horizon as the evening wears down into night. In the taverna were some Macedonians from the north of Greece, there was toast after toast to ‘Makedon’ their home. Today Kalamaki is much larger, but still a village. All along the front are new tavernas, bars and restaurants and today it is a holiday destination for all nationalities. But it still has the one of the finest beaches in Crete, alas not the original tavernas or the shrimps. 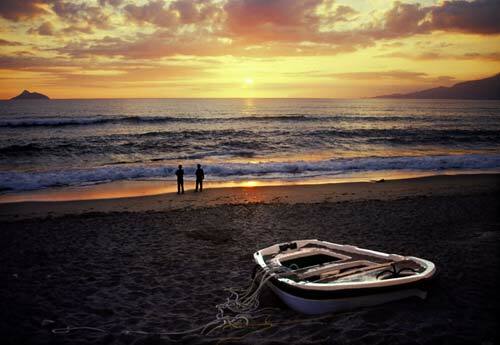 But still the sun winds gently into the sea as one and all stare at the beauty of this stunning moment. This is a wonderful place. Enjoy!